The Simple Life of a Queen: Life at home. 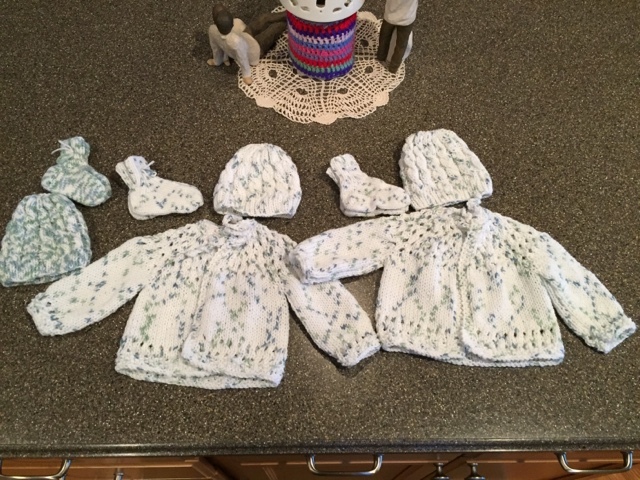 Five baby sweater, hat and sock sets plus an extra two hats and a pair of socks to use up the leftover yarn. I think these will go to the children's shelter here in Spokane. Our weather is getting colder and I think they will be needed by some little ones. Then, I had that lovely Knit Picks Willow yarn that Teresa gave me. 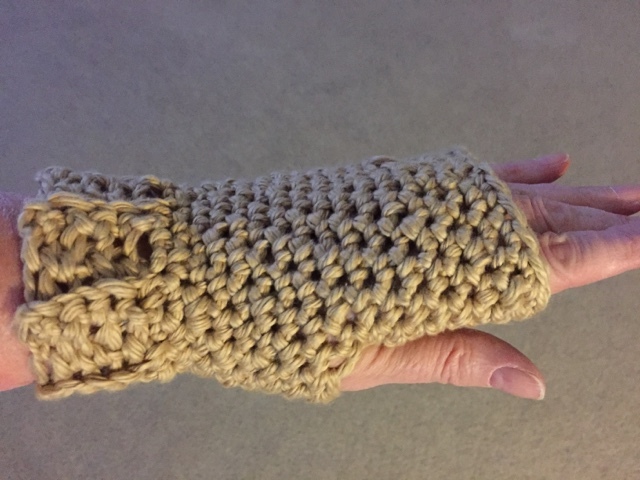 I made these wristwarmers with it. I wish you could feel how soft these are and the pattern was so fast. I had this pair done in about 2 hours! 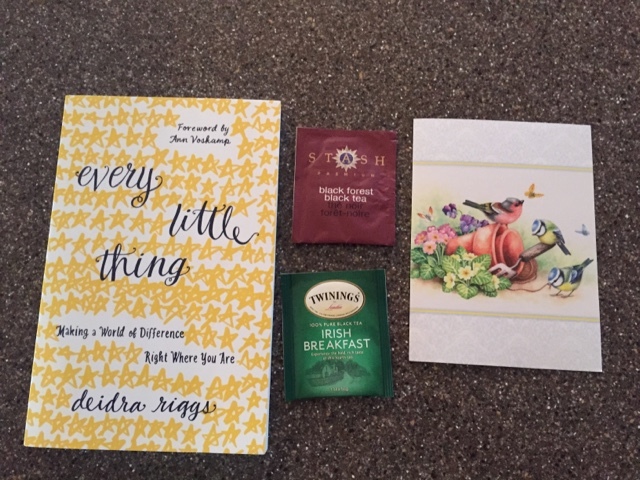 Thank you SO much Teresa! I love them. I also won a giveaway by Becky (GrandmaBeckyL) on my sidebar. I have three books going already but I'm looking forward to devoting my attention to this one very soon. I've already drank, (drunk?) the tea and it was delicious. Thank you so much Becky! Are you all tired of Halloween pictures? I'm sorry but I have to show you my little ones. They're too cute to keep to myself. Grandma's opinion of course! Miss Piper is Anna from the movie Frozen. I have not idea why her eyes are closed but isn't she the cutest thing? Kyleigh and Caleb. Oh how I love these two. 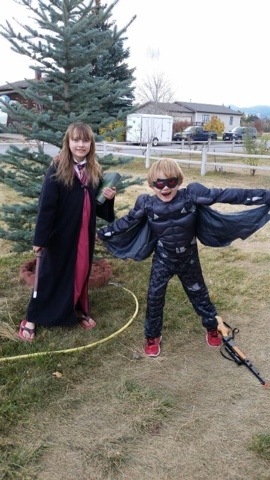 Kyleigh is Hermione from Harry Potter and Caleb is "The Falcon" whom I am told is a superhero. I'm kind of out of date on the new super heroes. Aren't they cute? I started the squares for Alex's vintage blanket on Friday night. Each is bordered with a dark brown. Here I have them all laid out on the floor trying to get a good mix of the colors. 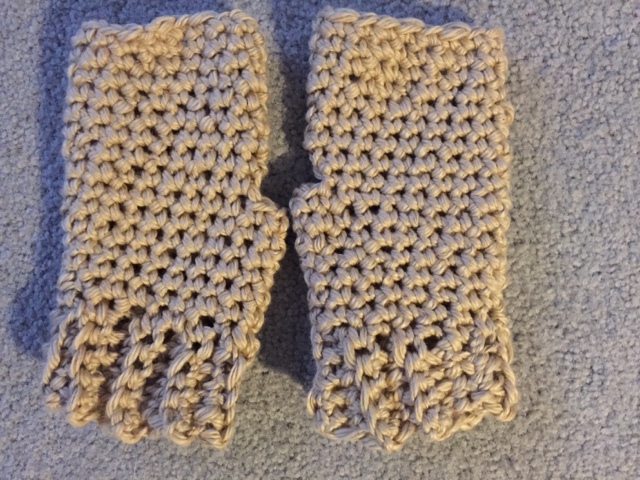 Last night I crocheted them together vertically. Tonight I'll work on the horizontal rows and hopefully begin the border. After I finish Alex's blanket, his girlfriend has requested a blue and red blanket. She doesn't like stripes and I'm going to be tired of squares after this one, so I need to find a pattern for her blanket. I would like to get these mailed by mid November if possible so they have them in Tokyo by Christmas. They have both asked for blankets as their Christmas gifts and I'm honored that they want something homemade by me. This morning I spent 2 hours at the cardiologist. All is going very well with the pacemaker. They "interogated" it and can see that it is working just as it should. It is pacing me about every 100 beats of my heart or so. My heart does well on it's own, but the pm steps in when it gets "lazy". I don't have to go back for 6 months unless something comes up. Yay! He gave me directions on flying and going through security. Thank goodness he gave me the okay to fly since we already bought tickets to Mandy's. I wanted to get them before they got too expensive. I can't go through airport scanners anymore so I guess it will be pat downs for me from now on. My back is still not happy though, and so tomorrow I am going to see an acupuncturist who did wonders for my feet a few years ago. I'm hoping she can work her magic on my back too. I always enjoy seeing her anyway, she's a lovely young lady who truly cares about the people who come to see her. We're starting to have cooler and wetter weather here which is very, very welcome. Well, the wet is welcome but I do prefer warmer weather and open windows over furnaces and fireplaces. I hope it continues to rain every other day or so like it's been doing the past week and a half. The yards and foliage look so much better with the moisture. It's hard to remember that we usually have snow on the ground by now. I am always reminded by the Thanksgiving holiday in November to try to be thankful each moment for the blessings that have been given to me. Each one of you are a blessing in my life. I appreciate each an every one of you taking the time to visit me and I hope you all have a lovely week. Your projects are lovely and so are your grandchildren. Glad your pacemaker is doing it's job. It's been cool the last couple evenings and this a.m. when I headed to work. Rain here a bit and some snow in mtn areaa is a good thing. It's layer time clothes wise! Hugs and I'm thankful for you too, my friend! Enjoy your book! Great news from the cardiologist. I love the photos of Piper, Polly, Kyleigh and Caleb. I adore children in Halloween costumes. Have a wonderful time visiting with Piper and her Mom and Dad and have a safe flight. I love the little baby sets you've done and they'll be so welcome in the cooler weather. Alex's blanket is gorgeous - the colours look so well together. 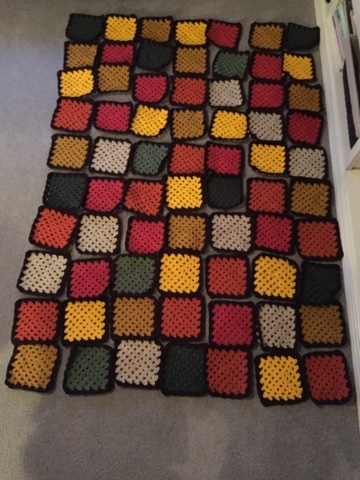 Why not do hexagons for the other blanket? I'm glad you got on well with the cardiologist and hope that the work on your back will be successful. I'm glad you're mostly feeling well and I hope your back is better soon too. Your knitting is so beautiful and your crochet too. I just love those baby sweaters. 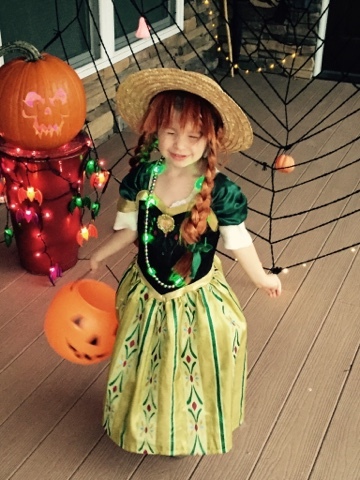 Your grandchildren all look adorable in their costumes! I'm glad they had lots of fun on Halloween. Take care and enjoy the rest of the week. 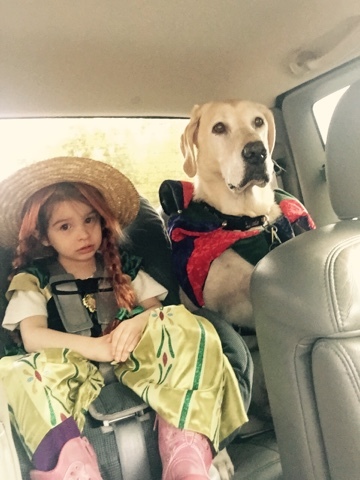 That photo of Miss Piper and Polly Dog is absolutely priceless! All of your grandblessings are cute! Glad to hear you are doing better--well except for your back. I believe in acupuncture too--when I had horrible headaches they were able to really help me. Your work is amazing Betsy--what a talent you have and what a good, giving heart too. Love seeing all the lovely things you made. So very glad you are feeling better...prayers for the back to be better soon, too. What a cutie! I have not seen Frozen but I know my daughter the teacher is really sick of it! LOL! That's all the girls talk about, sing about, dress as...everything they could market has been snapped up by these young gals. I had to laugh at my daughter. I think she looks more like Anne of Green Gables and that is one of my favorite characters. Either way she's precious and the picture of her and her sidekick is frame worthy for sure! Can you take walk now that your pacemaker is in place and functioning properly? It's great for keeping your spine in alignment and also some lifting of light weights like canned goods would help keep your back muscles strong which supports your spine. Ask your doctor but there are things you could do to keep yourself mobile and out of pain. 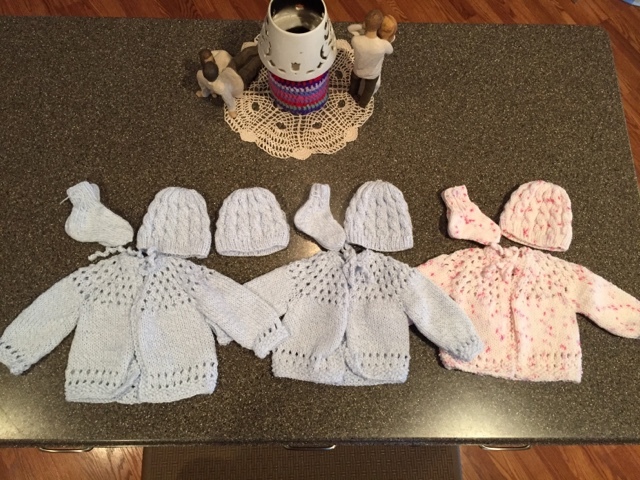 Those baby sets are darling and you are amazing at the amount of crochet you get done. Speedy Gonzales of crochet! You do need to get up and move though once in awhile! LOL! The old saying..."if you don't use it you lose it" is true. I told my son-in-law who is a great couch potato that if you lay around immobile for too long your body thinks you are dying or dead and your organs start shutting down so keep moving! LOL!